The ultra long, fine, silky coat parts along the spine and falls straight down on either side. It is steal blue on the body and tail, and tan elsewhere. Puppies are usually black & tan. The tail is usually docked to half its length. If the dogs are not for showing, the owners usually go for the shaggy look. The Yorkie has a flat head, medium-sized length muzzle, a black nose, and regular teeth. The eyes are extremely vivacious and the ears are v-shaped, erect or semi-erect. The tail is docked to medium-length and is carried level with its back. Its limbs are straight with round feet and black nails. The hair on the head is so abundant that it is almost always necessary to gather it in a band to keep from going into the dog"s food bowl and to give the animal maximum visibility. Some owners choose to trim the hair on top of the head. The Yorkshire Terrier seems oblivious of its small size, ever eager for adventure and trouble. It is busy, inquisitive, bold, stubborn, and can be aggressive to strange dogs and small animals in other words, it is true to its terrier heritage. Although some tend to bark a lot, it can easily be taught not to do so. Regular grooming is needed. 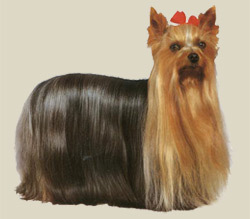 A clipped coat needs daily to weekly combing and brushing. Topknot is usually tied back with ribbon. Full show coats need hours of grooming. They should have their teeth cleaned regularly. This breed sheds little to no hair.